Packing them into the body cavity isn’t enough to keep your guitar's components totally safe from the elements. It’s important to make sure that you’re cleaning them regularly to avoid detrimental problems. 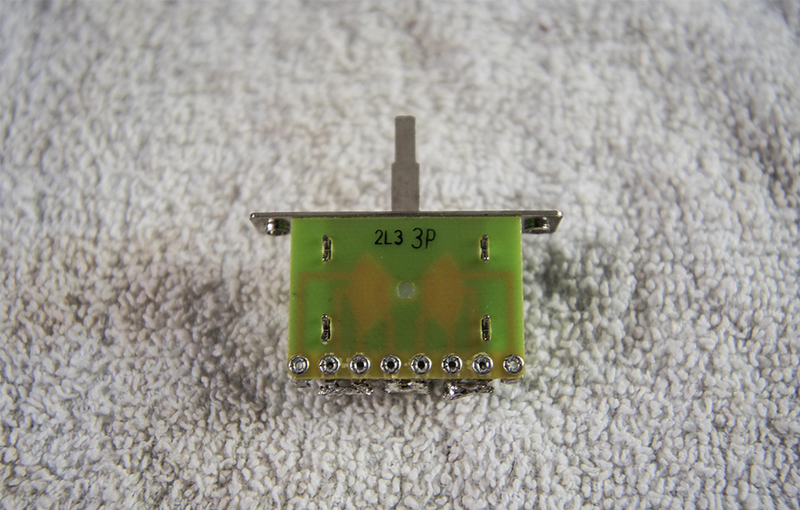 Although they’re usually sealed away inside the body cavity, switches and pots are still susceptible to dust, dirt, and debris that can easily find its way into the body cavity and onto the connections carrying the guitar’s signal to the amp. 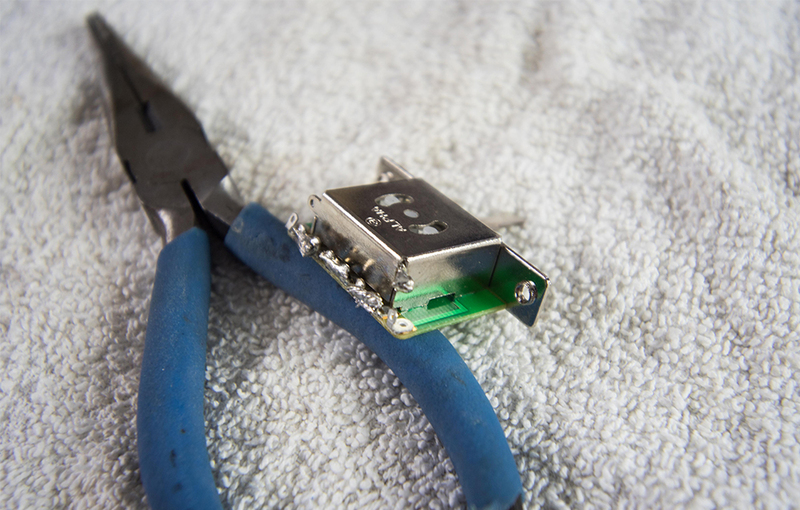 Changes in heat and humidity can render soldering points inactive, and even air itself can cause thin layers of corrosion or oxidation on the terminals. 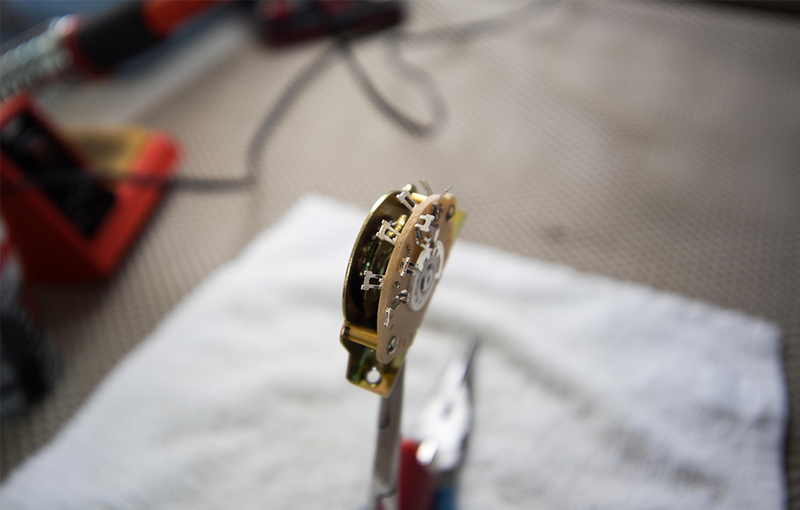 Naturally, it’s important to clean those components, especially if there’s any sign of corrosion or interference. Scratchy-sounding pots can be prevented by blowing compressed air into the pot’s housing and following up with a couple of squirts of a deoxidizing spray to clean the connection. Be sure to turn the pot’s shaft while spraying, ensuring that the solvent makes even contact with the interior. Also, starting with compressed air before using the deoxidizing spray is highly recommended, as the spray will only moisten dust and likely make the problem worse. 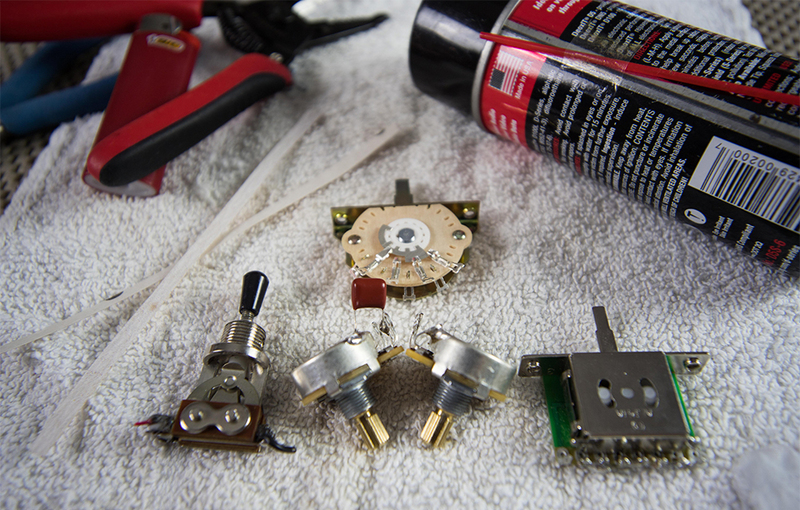 Cleaning a switch is a little different in practice, but identical in principle. Failing connections can be easily cleaned up by removing corrosion on the terminals. 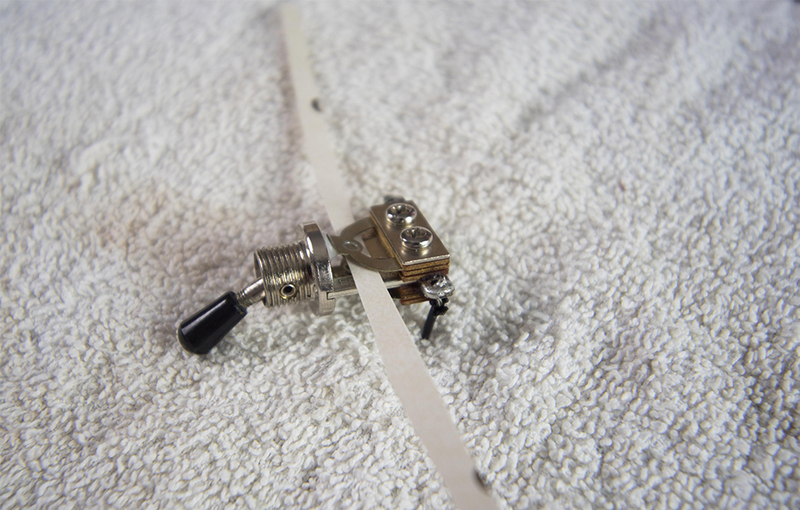 For a Gibson-style, three-position switch, run a thin strip of double-sided 400-grit sandpaper between the tabs, put the switch into the “blend” position, and move the sandpaper back and forth through the terminals. You’ll only need a couple passes before you can visibly see a difference, and probably hear one too. 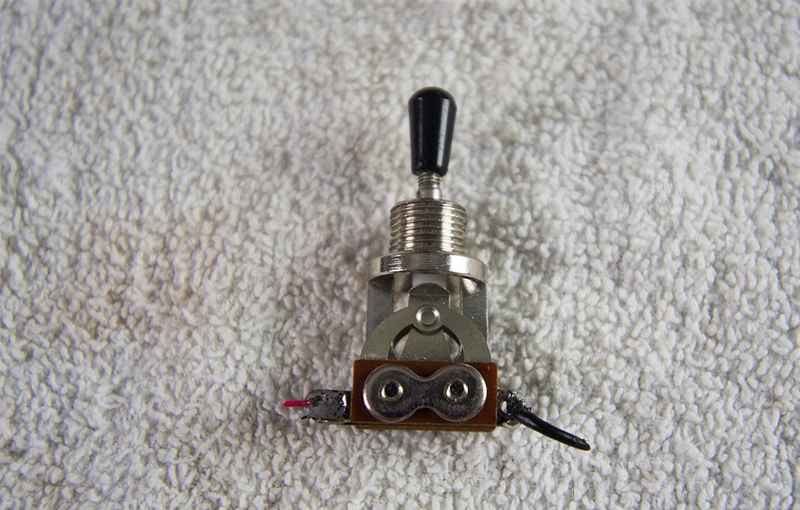 Fender-style fan-blade switches are a little more delicate but can be cleaned easily with a quick spray of deoxidizer onto the terminals, followed by quickly throwing the switch through each position. 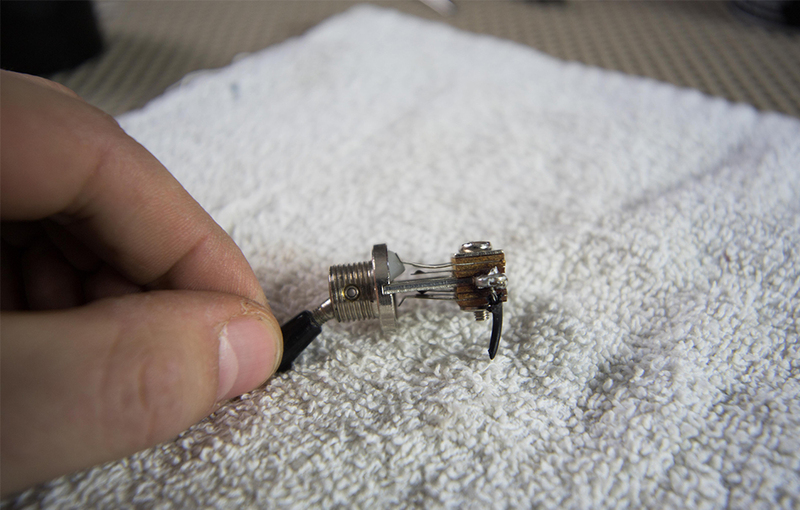 Like turning the pot’s shaft while spraying, moving the switch back and forth helps work the solvent into the nooks and crannies of the switch’s connections. 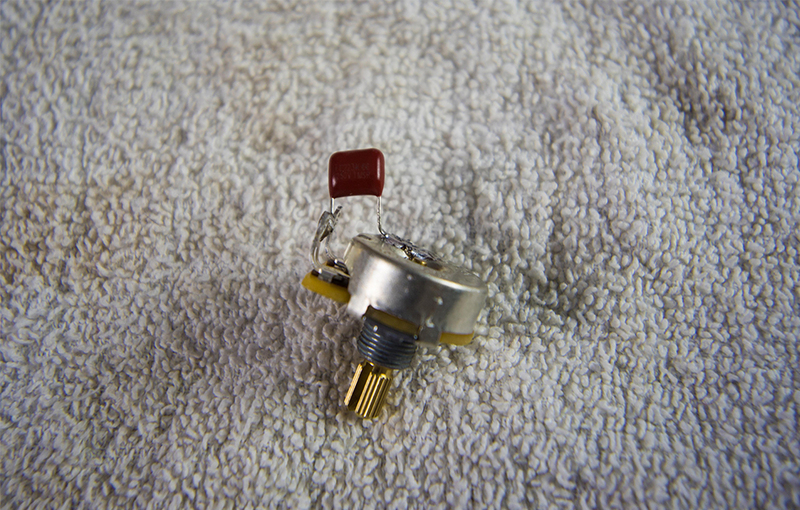 Box-style switches are impressively straightforward. 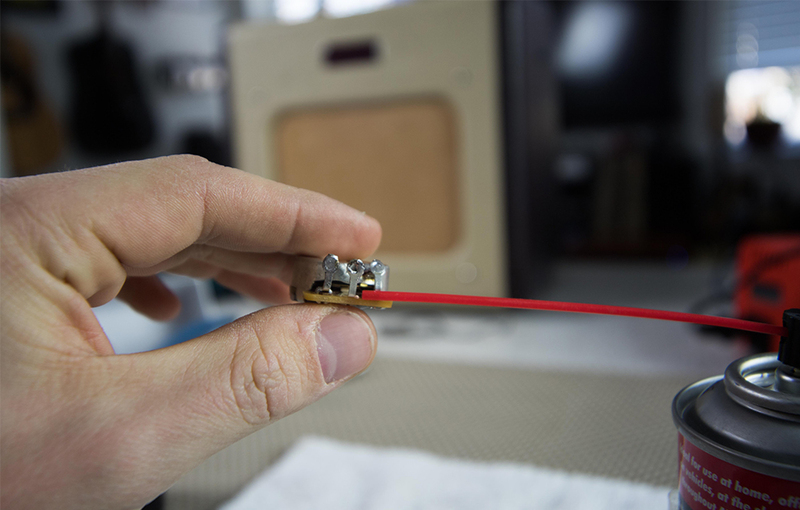 Although the terminals and connections are sealed up in a shielded housing, there’s usually an opening just wide enough to spray through. Compressed air and deoxidizer will work wonders if the switch has any issues.